The Chairman and CEO of General Electric (GE) has been in Korea, meeting with President Park Geun-hye and with industry counterparts at Samsung. Some of his comments are quite interesting. As reported by the Korea Times, at a Friday press conference he called Korea "...the heartbeat of the world and a healthy place to invest." Immelt also had some comments to make about conglomerates, at a time when Korea's family-controlled chaebol business groups are coming under criticism. 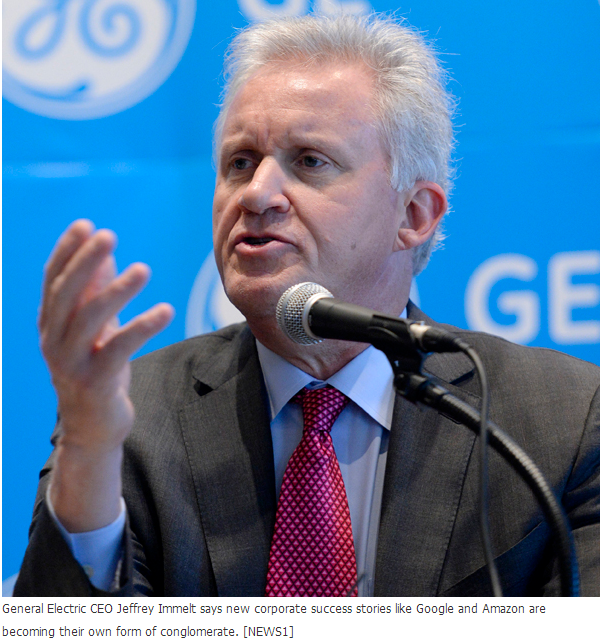 As noted in the Korea Joongang Daily,"Immelt said that people might have legitimate concerns about the conglomerates both in the United States and Korea, but he said that a company can be good at multiple areas while creating better efficiency and value. He said new corporate success stories like Google and Amazon.com are also expanding to become “their own form of conglomerate.”"
He also said that "..the Korean government’s creative economy initiative will increasingly put Korea in value-added areas. He said the initiative gives GE a sense of where to invest further in Korea.For instance, the Korean economy has the best information technologies infrastructure of any country that we compete with in the world,” he said, citing the industrial Internet as an example."